Unite the union is calling on Wishaw and District Housing Association in Scotland to stop attacking the conditions of hard-working members. Workers at the housing association will strike between Friday 28 October and Wednesday 2 November. This follows four previous days of strike action at the end of September. The housing association is looking to take four days’ holiday a year from the staff and to increase their working week by 30 minutes – the equivalent of four additional working days a year. 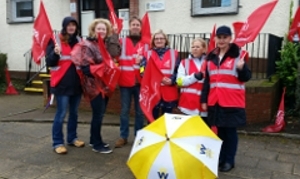 Unite says this is the latest in a series of attacks on the pay and conditions of workers at Wishaw Housing Association – and is a cut too far. 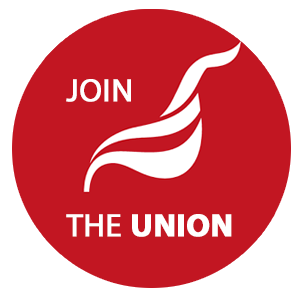 Unite regional officer Gordon Casey said: “Over the last three years our members have accepted their pensions being massively reduced, their wages being cut, their bereavement leave being reduced almost by half, and lunchtime opening to provide a better service to tenants. “They have shown good faith and patience with the Association and have always worked hard for the benefit of tenants and the wider community. Instead of being thanked, they have been threatened with further cuts to their conditions. “We have tried unsuccessfully to negotiate with the Association’s Chief Executive and Board. Our members have offered them ideas on saving money, none of which have been taken up. We don’t believe these cuts will save money – and we don’t understand why they are being forced on our members at a time when the Association is making a surplus. “All our members want is fair working conditions, dignity at work and some basic respect for their hard work and the sacrifices they have already made. Some 14 Unite members will take part in the strike action, including housing officers, senior staff customer services assistants, cleaners, maintenance assistants, and accounts assistants. In a ballot in August, 100% of Unite members voted to take strike action against the cuts.